Every week this summer, we'll be taking an historical tour of the Hollywood blockbuster by examining an older film that is in some way a spiritual precursor to one of the weekend's wide releases. This week: seven films into a 14-year-old franchise, X-Men: Days of Future Past trots out everybody's favorite hackneyed genre trick, time travel, to add some spice and get the widest possible array of desirable actors assembled in one place. Time travel being one of those conceits that transcends genre and tone, I thought it would be worth having a little fun with it, and checking out the other high-concept time-travel comedy of the 1980s. 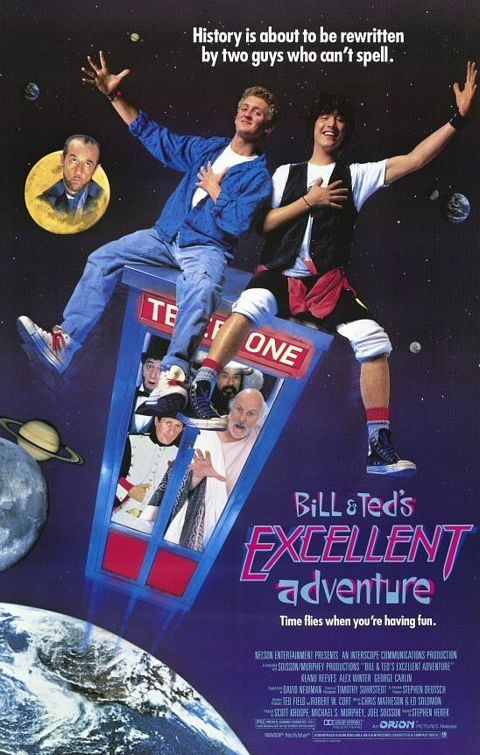 There is nonsense; then there is abysmally foolish nonsense; then there is Bill & Ted's Excellent Adventure, a film that manages to make its almost unmitigated, frivolous nonsense into a legitimate strength. This can be done, though not very often, and rarely in the case of such an obviously trivial work - cult classic though it might be now, there's no sense at all that the filmmakers behind this weird little idiot-driven high school musical lark had any intention towards making something that would last even as long as its 1989 release date. The disintegration of De Laurentiis Entertainment group pushed the film, shot in '87 with an eye towards coming out in '88, back a whole year, and given the zestiness with which Bill & Ted anatomises Southern California metalheads of an extremely specific sort, there'd have been every reason to assume that it would be dated on arrival. Instead, the film launched catchphrases and slang from a minute corner of the world into a whole nation (like the Frank Zappa song "Valley Girl", part of me wonders if the film tended to lead to the milieu it depicts, rather than the other way 'round), and making an unlikely move star out of Keanu Reeves, whose career for a quarter of a century now has rested mainly on people being utterly confounded how somebody who can't really act keeps getting such a weirdly broad variety of roles. For this, we can point to the obvious: no role in Reeves's career, not even the empty shell of slacker tropes Neo from The Matrix, is so well suited to his actual self in the moment of its creation. Need a loopy SoCal dude; cast a loopy SoCal dude. Reeves plays, in the film, Ted "Theodore" Logan, one-half of the spectacularly ambitious, spectacularly untalented garage band Wyld Stallyns in San Dimas, CA. His best friend and partner in crime is Bill S. Preston, Esq., the marginally more intelligent of the pair, played with a spaced-out élan to match Reeves's by Alex Winter (the vagaries of fate: insofar as it's possible to draw a line between the two performers, I think Winter is slightly more appealing and I can think of no reason that his career should have lain dormant while Reeves started getting role after role almost immediately, even those for which he was profoundly and obviously unsuited. Hi, Dangerous Liaisons. And a grand hullo and good day, Bram Stoker's Dracula). But those are petty, niggling distinctions, in the face of the one epochal, unutterable truth of Bill & Ted: it is a very dumb movie that should be impossible to watch, but it turns out to be a truly dazzling and delightful sci-fi comedy, and it owes this almost completely to how phenomenal Reeves and Winter are in their roles. It may be, entirely, that this isn't really "acting" but simply being natural: nothing in Reeves's subsequent career suggests that Ted was much of a stretch for him, and of course there simply hasn't been enough evidence presented of Winter's range or talent. Maybe he has a life-changing, revolutionary Falstaff hiding in him just waiting for the right brave director, I don't know. My point, anyway, is that it doesn't matter: Bill & Ted puts all of its chips on Bill & Ted functioning as a very specific kind of easy-to-like doofuses: ambitious morons whose enthusiasm and unbridled innocence, almost a kind of pre-intellectual manner of understanding the world, flavors their generic bro-ness with sweetness and humanity. In life, Bill and Ted would be unendurable: their astounding stupidity, their crudely utilitarian understanding of women, their mutually reinforcing inability to comprehend the ways in which real life is nothing like their vision of it, would all make them impossible to tolerate for more than a few seconds. But the movie makes a solid case for them as a pair of utterly charming underdogs whose very obliviousness makes them figures of comic pathos, and that is due almost entirely to the acting. It's not that Bill & Ted is otherwise "bad". It's just profoundly run-of-the-mill: director Stephen Herek, whose solitary previous directorial credit was the horror-comedy Critters, does as good a job as he needs to in keeping the tone frothy and pushing through the first act fast enough to quickly lay out the scenario provided by screenwriters Chris Matheson & Ed Solomon with clarity but without any chance to dwell on it. That scenario being that Bill & Ted, if they fail an upcoming history test, will flunk and be unable to find musical success, which in turn means that the will never become icons of peace and love and the centuries-distant future will be a dystopian hell. So an envoy from the future, Rufus (George Carlin, whose very level but distinctively ironic performance matters almost as much as Reeves's and Winter's in making us meet the film on its own level), has come with a phone booth time machine to let the boys travel through history and, as it were, learn by doing. There's a neat line the film walks, between letting that situation exist on its own terms and winking at us, saying, "it's awfully silly, isn't it? But let's run with it anyway", and the blunt speed of the opening is vital in building to that point. But Herek does not otherwise do much to give the film personality: it looks like a cheap '80s comedy (the visual effects and costumes are all pretty rough), shot without the remotest visual flair. Most of the humor that doesn't involve the title characters is played much too shrilly, with a game cast of mostly unknowns playing the gamut of historical figures that the duo end up dragging through time, and finding only a mechanical proficiency without doing anything to really sell the comedy (the only joke that I find actually works is one involving Rod Loomis as Sigmund Freud holding a corndog on a stick right up in front of his chest where you can't miss it; it is funny almost entirely because it's the one place where the film expects us, the audience, to know anything about the historical characters, and so does not bother stressing it or even mentioning phallus imagery in passing). And the climax of its "celebrities from history get lost in the mall!" montage is, I find, quite dire altogether, both because it is hackneyed and because it is doesn't really find anything fun to do with the characters, while being a little too okay with indulging in broad, boring stereotypes regarding virtually every one of the characters (which we might defend as being part of the film's indebtedness to the heroes' worldview, except that there's a lot of evidence that we're understood to be smarter than they are). But there's a lot that you don't need when as much of a film is working as well as Bill & Ted does as a basic hang-out movie: we are aware that Bill & Ted are stupid, we laugh them, we acknowledge our superiority to them, and yet they are immensely likable and fun to spend a short 90 minutes with. They're entirely approachable, normal, everyday heroes: God only knows how much of actual '80s teen culture the film captures and how much it of it is just invented nonsense, but Bill & Ted themselves have a considerable touch of the real; they feel like the kind of goofballs that everybody knows or knew, and nobody every really disliked, because they were just too damn harmless. They are, in effect, stupendously easy to root for,because they are very average and ordinary and idle in their supreme teenage-ness. And once a movie has characters that you can't help but root for, it's pretty much already won the battle as a work of simple but effective entertainment. It's nothing like a great work of comic cinema, but there's a good reason it has clung stubbornly to a cult audience for a quarter of a century.